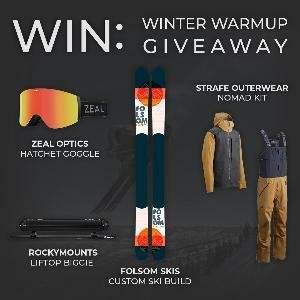 Prize: 1 pair of CUSTOM SKIS from Folsom Custom Skis, set of NOMAD Jacket & Bibs from Strafe Outerwear, set of HATCHET Goggles from Zeal Optics, and LiftOp Biggie roof rack from RockyMounts. What you must do to enter: Gleam. Statistics: This contest was opened by 78 and entered by 6 ContestChest.com members. 8% of those who opened the contest, entered it.